A Catholic school in Alabama will accept the cryptographic currency known as Bitcoin in its major annual fundraising event. 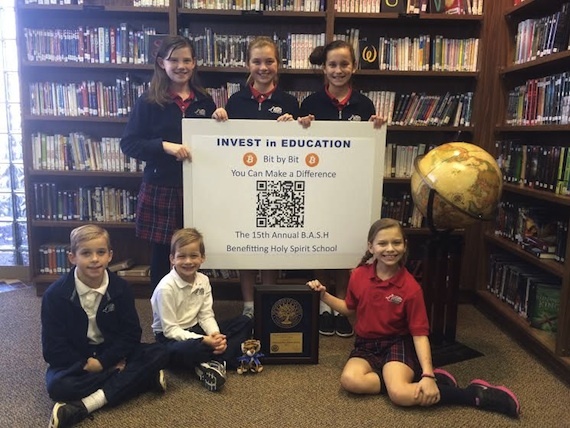 Holy Spirit Regional Catholic School in Huntsville is enabling supporters to donate Bitcoin and purchase reservations using Bitcoin for its 15th-annual BASH event ("Building an Academic and Spiritual Heritage"), which is sponsored by both the parent teacher organization and the school foundation. The event includes a dinner and silent auction. Reservations run $87 per guest. According to Carlen Williams, HSRCS parent and BASH event chair, educating the community about Bitcoin started off slowly, but the school is partnering with yBitcoin Magazine, whose editor, David Bailey, is an alumnus of HSRCS (and brother of Williams), to provide a series of primers to potential donors. "Our first step was to introduce Bitcoin through the BASH, but, ideally, the lessons will continue throughout the rest of the year," Williams told THE Journal. "Students were in the photo; an informational piece is in our school newsletter; and we'd like to introduce an age-appropriate Bitcoin talk to the students later this semester. We even discussed Bitcoin at our PTO Board meeting last night — conversations about Bitcoin started off slow, but accepting Bitcoin (and receiving the subsequent coverage) really has people talking!" A little more than 12.25 million Bitcoins have been mined to date. Only 21 million Bitcoins can ever be created. Similar cryptographic currencies include litecoin (currently trading at about $23.86 per coin), namecoin ($5.90) and novacoin ($13.98), to name just a few. The poster child for all cryptocurrencies, Bitcoin gained some notoriety as the currency of choice for the online black market known as Silk Road and at times has come under scrutiny by governments around the world. But for the most part, it has gained at least tacit acceptance and is legally traded in most countries, including the United States. Local and national retailers, from a Subway franchise in Allentown, PA to online merchant Overstock.com, have even begun accepting Bitcoins for purchases. For the fundraiser, Williams set up a Bitcoin wallet, where all Bitcoin donations will be held, and generated a QR code to allow donors to send in Bitcoins easily. The QR code in the image above, which was distributed to the Holy Spirit community, contains the Bitcoin wallet address for the fundraiser. As for exchanging the Bitcoins into a more liquid currency, Williams said: "We will use Coinbase to convert the Bitcoins to dollars and then link our PTO bank account to Coinbase"
Williams said that the concept gained immediate acceptance. "Accepting Bitcoin seemed like a great way to generate some buzz about our event and engage our tech-savvy community. I met with the principal of our school in August (Mr. James Bell), and he quickly grasped and approved the concept. We just moved forward from there. I have not yet heard of any resistance." Williams added: "This has been such a simple process that as a complete Bitcoin novice I have created a wallet to store the donations, printed a QR code to receive the donations and link a bank account to the exchange for cash. I will admit that I was intimidated at first to do this, but it has been refreshingly simple!"